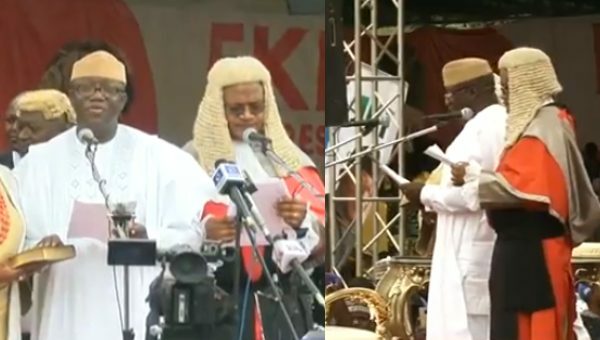 Fayemi sworn-in as Ekiti governor for second term – Royal Times of Nigeria. The immediate past minister of Solid mineral resources, John Kayode Fayemi, has been sworn in as the governor of Ekiti state for the second term in office.The oath of allegiance and oath of office were administered on Fayemi and his deputy, Bisi Egbeyemi by the chief Judge of Ekiti state, Justice Ayodeji Simeon Daramola. Fayemi, who was the governor of the state between 2010 and 2014, lost his re-election bid in 2014 to another former governor, Ayodele Fayose, in a controversial election that saw the incumbent losing in the entire 16 local governments areas. He was however reelected governor on July 22, defeating his closest opponent and the immediate past deputy governor of Ekiti state, Professor Kolapo Olusola Eleka. Fayemi’s inauguration ceremony was attended by President Muhammadu Buhari, who was represented by the Secretary to the government of the federation, Boss Mustapha. Also, the national leader of the All Progressives Congress, Asiwaju Bola Ahmed Tinubu, Chief Bisi Akande, Chief John Oyegun, and other top chieftains of the party. In attendance were the governors of Lagos, Akinwunmi Ambode, his Oyo counterpart, Abiola Ajimobi, Rotimi Akeredolu of Ondo state, Ibikunle Amosun of Ogun state, Nasir El-Rufai of Kaduna, Jigawa state governor among others. Court jails woman for human trafficking.